This is the third book I have read by Tracy Rees and I think it's her best one yet. I enjoyed Amy Snow and Florence Grace, but I loved this book. The author comes from Wales and you can feel her love of the places she describes and having been to Wales myself on numerous holidays as a child I could see the beautiful beaches and sand dunes in my mind of all those years ago as a little girl (although my time there as a child was much later lol) The book is set in two times periods, the now and 1950's Tenby. The story is told through the perspectives of Chloe, the young girl who stays at her aunt Susan's every summer for three weeks a year and her fateful meeting with a local lad, Llew Jones. Llew is two years younger than the 10 year old Chloe but the age gap is incidental as he is a bit of an old soul. They have an instant connection and become firm friends. Reading their adventures and times together, their dreams and aspirations as the years slip by and childhood runs through their fingers. As they grow and change, so does how they see each other. It takes a terrible catalyst for Chloe to realise the nature and depth of her true feelings for Llew.The other half of the book that is set in the present or at least 2015, tells the story of Nora. She has just come to a milestone in her life and turned 40. She has taken stock of her life and quit her job and gone off to Wales to sort herself out. She has links with the place, being half Welsh herself from her mother's side. There is a bit of mystery as to why her mother is so reluctant to talk about Wales or her times growing up there and over the years it has been a bit of a stumbling block between their mother/daughter relationship. After spending time in Tenby and making friends with a local woman a few years her junior, she decides to settle there for a few months before deciding what to do with her life. It is during this time that the past catches up with both mother and daughter and the mysteries of the past begin to unfold.It is a story about second chances, no matter how long you have to wait for them and also at the heart of it is the complicated relationships that can be between mother and daughter. It has a bit of everything and was every bit a satisfying read. This review was originally posted on Between My LinesDo you like contemporary fiction and historical fiction? Well if so, you are in for a treat with The Hourglass by Tracy Rees, as it mixes both together flawlessly.Balancing the books is a quick fire review where I list the assets and liabilities of a book (as I see them) and leave you decide if you think this book is worth investing in. 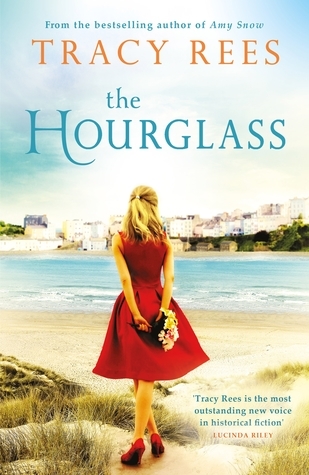 The Assets of The Hourglass by Tracy Rees: 2 Fascinating Points of View : Chloe, a teenager in the 1950s who lives for her summer holidays in Wales every year. And Nora, who turned 40 in 2014, and is realising that she hates her life and is ready to change everything up. I loved both voices equally and happily flip-flopped between their story arcs.1950s Wales setting: OMG, this setting was fabulous. Think innocent times, days spent exploring, beach day after beach day, picnics, the excitement of your first teenage dance, freedom and ice cream. I wanted to time-travel and be Chloe!The symbolism: I loved the hourglass symbolism. Both Chloe and Nora are at turning points in their lives and the image of an hourglass captured that so well. It’s also important for other reasons, and I appreciated how well that all fitted together.Warmth: The book radiates warmth. The characters are lively, and I loved the friendships and romances.Emotional Plot: Such a poignant plot, it made my heart beat faster with all the feels. I 100% fell in love with all the characters and feels were spilling over. The Liabilities of The Hourglass by Tracy Rees: I’m racking my brain, because I like to nit-pick! But I can’t find anything I hated. It takes a little bit of time to fit everything together, but that’s part of the charm of the read. So nothing!Investment potential of The Hourglass by Tracy Rees: If you like the sound of a contemporary/recent historical fiction mash-up and a heartfelt plot, then yes definitely you should read this. If you are a fan of authors like Kate Morton, or Julia Crouch, then you might also like this one.Thanks to NetGalley and Quercus Books for giving me a copy of this book for review consideration. As always, no matter what the source of the book, you get my honest, unbiased opinion. Talk to Trish: Do you like symbolism in books? The hourglass title had so much significance and it really made me appreciate how much thought the author put into her theme and subsequent title. Tracy Rees has been dubbed ‘The most outstanding new voice in historical fiction’. While I would love to agree with author Lucinda Reilly on this one, I can’t. I really enjoyed Rees’s first book Amy Snow but The Hourglass fell short of the mark. Initially I was drawn to the beautiful front cover of a woman standing on the beach holding a bouquet of flowers, wearing a vivid red dress. I wandered how an hourglass would be interwoven. When I saw the author, it quickly became a must buy. The dual storyline with alternating chapters between the past and present also drew me in as this is one of my favourite writing techniques. Set in both 1950 and 2014, I found myself favouring the 2014 plot. This is highly unusual for me because I adore historical fiction. However, 1950s Chloe in Tenby bored me. Chloe is the main character of 11 years old who visits Tenby once a year, staying with family. While I got to see Chloe grow a little older each summer, nothing really happened. She’s like every other teenager who wanted to hang out with the cool kids and has a major crush on the wrong boy. This was a huge letdown as the blurb promised that the ‘aftermath of a date would haunt her forever’. Disappointingly I predicted what would happen and it did, three quarters of the way through. It felt a little too late and too rushed at this point. 2014 Tenby was much more fascinating as the story arc followed 40-year-old Nora dealing with her relationships issues, mainly her ex boyfriend and parents. I could relate to Nora coming up to the big 4-0 myself but more importantly, events happened to her. Of course, there’s always a connection with two characters in a dual narrative which I though Rees kept well hidden. At over 500 pages, I thought more should have happened to Chloe or Nora’s life should have been the main focus. As for that hourglass, well I won’t give the significance away but it was flimsy at best. I received an electronic copy of this book for free from Net Galley in exchange for an honest review. I have never read any of Tracy Rees' books before so I was very excited when Net Galley approved this book for me to read and review. This was definitely a long book but it held my attention throughout the entire book. The cover is beautiful and what drew me to the book but I was delighted to find the contents were just as good, if not better than the cover. I can't wait to go back and read more by Tracy Rees! 5 Words: Family, love, summer, expectations, sea.Despite knowing that this was set both in the (almost) modern day as well as in 1950, part of me was expecting to delve further back in time. Tracy Rees has perfected historical fiction, her writing style and tone transport you right back.Right from the start I could picture everything perfectly. Chloe is such a vivid character that I pretty much instantly fell under her spell and her parts were my favourite parts to read.The story itself was a bit slow to start, but once I was properly introduced to the main characters I was hooked. It didn't really pick up until near the end, with twists driving it forward, but the pacing suited the beautiful writing and the story, and I was glad it held back and stayed relatively slow. This is perfect for reading in the summer, lounging in the sun. It's not fast paced, it's a slow, leisurely read and I spent a lot time lost (in the past especially) in Tenby. I really want to visit Tenby now! I love Tracy Rees, she is an excellent author and her books are all very different which is great in an age where writers seem to get away with writing the same plot over and over in new locations, I own all her books but this one although well written, lacked the five star qualities of the previous two. It was bland, Nora's story was just like padding out a narrative, Chloes story was the only part with a real story and even that was not exciting. There was no mystery at all and I was bitterly disappointed after the excellence of previous books. This will not deter me reading more by this author, as she is a natural story teller, the book just lacked something this time around. Okay to curl up with on a winter's day.I found this book quite tedious and lacked spark. I usually like the opportunity to switch between time periods, but this one just didn't keep my interest piqued. It was an obvious ending without much melodrama on the way. Thanks to NetGalley, Tracey Rees and Quercus Books for the opportunity to read and review this book. Nora is unhappy with her life. When a vision of a beach invades her mind she knows it’s time for a change, but little does she realise quite what fate has in store for her.When you have so loved an author’s writing and they move into a new era, there’s always a slight trepidation, but Tracy Rees writes with such emotion and honesty that it wouldn’t matter when she set her novels. Each is a delight to read. Set in two converging time frames of the 1950s and 2014, the narrative of The Hourglass evokes those times so perfectly.Once again I found myself drawn in to Tracy Rees’s wonderful story telling so that I set aside daily life until I’d devoured every word. She has such an eye for the incidental details that brings alive a text that I always feel I am in the story with her characters. This time, I was so enchanted by the idea of Tenby, a town so well depicted that it is a living character and not just a place in The Hourglass, that I have been researching places to stay there! I was with Chloe and Llew on the beach, looking for coins between the cracks in the pavement and chasing rainbows as if I had been transformed into Chloe herself.I’m not sure quite what it is about Tracy Ress’s writing that I enjoy so much. Yes, she writes perfectly natural dialogue; yes, she can convey character and setting brilliantly; yes, she researches time and place meticulously, but I think it’s her ability to convey effortlessly exactly how we are built and affected as human beings. When I read her stories I understand completely why her characters behave as they do and I am desperate for their lives to be happy ones. I found tears streaming down my cheeks at times reading The Hourglass and felt almost a physical ache in my heart because the nostalgia and melancholy -the Welsh hiraeth – that underpins the story is so powerful.The interplay of relationships is just beautifully depicted in The Hourglass. Chloe’s desperation to grow up and be accepted by those around her, Nora’s need for her mother’s understanding and Llew’s outsider status are utterly, utterly believable and compelling. There’s a real sense of how we never really fully know those around us. More importantly, it takes us a long time to really know ourselves. I adored this exploration and it isn’t an exaggeration to say that reading The Hourglass made me look closely at my own life and how I feel too.I was completely charmed, entertained and moved by The Hourglass. Once again, Tracy Rees has produced a book to mark a reader’s heart and mind. I loved it. 3.5 This is a very sad book. I didn’t enjoy it as much as the historical novels of Amy Snow and Florence Grace but it was still above-average for contemporary fiction.I know that in this type of story, the non-communication is what adds tension but I find it tedious after a while. The characters were a mixed bag. I couldn’t stand Nora at the beginning (whingy, job-obsessed) but as she mellowed out, I grew to like her. The opposite was true for Chloe. I really liked Chloe throughout childhood but after the last summer at Tenby, I didn’t care so much for her. She came across as self-absorbed, flighty and a bit of an airhead. I admit I felt the reconnection between her and Llew a bit cringey and forced. Kaitlin was wonderful. I really enjoyed her positivity in contrast to the other characters and the overall sad storyline. I really enjoyed the setting of Tenby. I had no idea that palm trees were naturally occurring in Wales, that was really interesting! The author really feels passionately about this area and it shines through. I think it’s brilliant when an author can manage to transport the reader to a new place through words alone. It’s profound. Overall, there wasn’t the “mystery” in this story that made the two previous books so well done. I think I figured out the Jasmine-Chloe thing within the first 50 pages as well as the Jones-Llew thing. Regardless, seeing the premise and the historical content in the promo blurb, I am looking forward to Tracy’s next book! Tracy Rees third novel, and whilst it is of course a novel set in the present and in the past, I found it different from her first two but I can't put my finger on what it was, as it is certainly as good as them.Present day: Nora suddenly has a clear image of a beach, a seaside town. It seems to be calling to her and it is a place she has only been to once in the past. The place is Tenby, Wales.1950s: Chloe spends three weeks every summer with her aunt and uncle at a seaside town. An opportunity which she spends the other 49 weeks of the year dreaming about. Not only the journey, but the beach and her best friend are their. The place is Tenby, Wales.It is clear that Tenby holds a spell over these two women. Nora stricken with anxiety and the fact she is forty and seems to have achieved very little in life, abandons everything she has job, flat, boyfriend and travels to Tenby as she attempts to find herself.As Chloe's summers are charted every year we see her grow, her blossom from girl to young woman, from small fantasies to big dreams and they are always most clear when she is in Tenby. The reality is somewhat different.Tenby is beautifully described and placed perfectly within the story. I was there visiting, I was walking the same path and viewing the same landscape and scenery no matter what the weather, the author does this effortlessly. Google pictures of Tenby and you will see even the cover correctly illustrates the place so beautifully.The story progresses between these two women and you do find out fairly early on the link between them as that is important as the story and the women's lives move in very different directions but oddly enough they move most importantly to each other. Suddenly the anxiety of the past and the present makes sense and the future now can be something very different. When the sand has run out, you have to turn the hourglass over and start all over again.Tracy Rees is an author you have to try if you have not before, if you like historical fiction, with strong characters who can you empathise with and perhaps dislike in equal manner as well as set amongst an ever-changing landscape then her books are for you.I am now just disappointed that I will have to wait a while to read her next one.Thank you to the publisher Quercus for the review copy of this novel. The Hourglass is out now. I was lucky to win a copy of this book in a giveaway by Books with Heart on their Facebook page.A story of Nora and Chloe which is set in the present and the past. Nora is Distressed with all that has been happening in her life. In order to get away from it all, she decides to go to Tenby a seaside town in Wales.Chloe visits Tenby every summer to stay with her Aunt and her family.She so wants her family to recognise and respect her. She meets her best friend Llew there and is looking forward to the big dance of summer.Both Chloe and Nora have found happiness by coming to this seaside town. Nora regains her confidence and has better hope for the future. She gets to reconnect with her grandmother . Chloe on the other hand has better relationships with her family members and her attitude towards life changes .A moving story of healing, secrets and the opportunity to make life more meaningful. The change in place and people around you can make a big difference and that's what this story is all about. The Author has described the settings and characters so well so as a reader we get to just flow with the story, its like we are in the seaside town. Excellent work and hope to read more of Tracy Ree's books. I love Tracy Rees’ writing style- she creates such wonderful characters and draws the settings so well that you can imagine yourself there. I love reading books set in places I know well- and this was a lovely trip back to holidays in my youth. Tenby is such a beautiful place that it was lovely to revisit it within the pages of this book.This is a timeslip novel set in almost present day and the 50’s and both stories are easy to get absorbed in. It really does recreate the magic of the Welsh coast. The 50’s is a fascinating era to visit and you feel as though you know the characters so well by the end of the book.I have Tracy Rees other books on my kindle and I just know I am going to love every page. It is great to find new favourite authors to add to your list to watch for the new releases. They have such beautiful covers that you are instantly drawn to them visually. Absolutely loved this book. 'sensible Nora' literally just loses the plot and upends everything on her life on a whim. Her subconscious tells her how unhappy she is snd she listens. The Norfolk beach calls and she answers that call by leaving the city to find herself again. The way this story weaves with the magical past life of 'chloe' or Jasmine as she is later known .... Noras mother is brilliant. You are literally rooting for her and Leo from the start and thank goodness they get there eventually! The story has love, laughter, mystery, sadness, heartache, crime and downright nomadic behaviour .... but it reminded me so fervently of long Summer days where the whole holiday panned kut on front of you as a child and absolutely anything was possible! This is a lovely long family saga, to read and enjoy for many hours. Nora is forty and single, she works and lives in London. She has been suffering from anxiety recently and now dreams of a beach that she visited long ago. So she gives up her mundane job, leases out her flat and moves to beautiful Tenby. Our other storyline which starts in the 1950's is about Jasmine, previously known as Chloe, who is Nora's mother. She visits Tenby every year from ten years old until dramatic events change everything for her when she is eighteen. The past catches up to the present in a great story.! Read on! I loved this beautifully written family saga following characters through different timelines. Chloe's story set in the 50's was achingly beautiful, just so well written and it thoroughly bought to life the era. Llew was a wonderful character, honestly, just who wouldn't want a friend like that! Nora's story in the present converged nicely with Chloe's and I became thoroughly involved in their lives. The setting of Tenby in Wales was fabulously depicted too. A super read and I'll be hunting down more from Tracy Rees. I am from Wales and have been to Tenby many times. It is a lovely place and the beaches are beautiful! It made me laugh though when, in this book, the weather there was nearly always sunny and warm! In my experience of living more than 50 years in Wales it rains more often than not!! Anyway back to the book... I have read and enjoyed ms Rees' books before and was looking forward to enjoying this especially as it is set in Wales. I did enjoy it and I liked the two timelines. It reminds me why I would hate to live in a big city like London! Slow at first I thought but by the end of the book I was thoroughly engrossed in the characters, the intertwining of storylines, the town of Tenby and just the loveliness of the narrative itself. The pace of the story by then did not detract but added to the suspenseful conclusions. It is a canvas of characters, well defined and real enough to grow attached to them and their stories against the backdrop of a small seaside town in Wales. I have read one other novel of Ms. Rees (Florence Grace) and found it as much a pleasure to read. Im looking forward to read others by this author! Nice holiday readI deliberately chose this book for light holiday reading and feel it was a good choice. The story, set in Wales, moves between mother (Chloe/Jasmine) and daughter (Nora), albeit mother is in the 1950s and daughter of current day. Love, mystery and family are all there, and you don't have to be a rocket scientist to guess very early on the ending. As I say, nice book, ideal for holiday or winter night on the couch. This is the third book I've read by Tracy Rees and the third time I've been devastated to reach the end!! She has become of of my favorite authors. I am swept into each book and am instantly living right there among the characters. I look forward to her future work and pray she has something out soon!! I visited Tenby, Wales earlier this summer and my sis-in-law told me I needed to read this book as it takes place there. I really enjoyed it! The book gets better the further into it you get. A very heartfelt story in a beautiful setting with a twist at the end (which is quite predictable actually, but still good). I will be honest, I struggled at the beginning and nearly gave up, but this is a slow burner that I got pulled into. Once the characters clicked I couldn't put it down and I absolutely loved this book.. there are a few books I have read that cry out to be a film and this is one of them! Now I want to visit Tenby and walk the beach! This book had heart and soul and I would recommend it highly! Story Telling at it's BestA lovely story with interesting characters set in beautiful Tenby. The descriptive writing brings Tenby to life, it is one of my favorite places.I recommended you read this book for a taste of the 50s through to contemporary times. I enjoyed this book more than I thought I would. It could have been twee - exactly the type of book I hate - but the characters were so vividly drawn I just went with it and they took me over. And, for once, a happy ending that felt right! This is set in the 50's and the present day. Its set in Tenby and the 2 stories are of Chloe and Nora and how this town makes an impression on them. Its a gentle and warm book perfect bedtime reading! This was such a disappointing read. After her two previous novels being wonderfully dark and Gothic, this one is completely different, very much a beach read bordering on chick-lit. Not really her best. Oh, what to say. Yes I enjoyed most of it, yes I finished it.Predictable and a bit schmaltzy for my taste.I guessed what was happens by about 50% through and it was a tad too saccharine/ sweet for me. Tracy Rees - Tracy Rees is a Cambridge graduate with a degree in Modern and Medieval Languages. After an eight-year career in nonfiction publishing, she worked as a counselor for people with cancer and their families. Amy Snow is her first novel. She lives in Swansea, Wales.